1.Prepare Ribs: Peel skin from bone side of each rib slab. Reserve 2 cups root beer for BBQ sauce. Place rib slabs in large baking dish or roasting pan; pour remaining root beer over ribs to cover completely. (There may be some root beer remaining.) Sprinkle ribs with salt. Cover and refrigerate 4 hours or up to overnight. 2.Prepare Root Beer BBQ Sauce: In small saucepot, heat oil over medium heat. Add garlic and onion, and cook 4 to 6 minutes or until onion is soft, stirring frequently. Add remaining ingredients and 2 cups reserved root beer; heat to boiling over medium-high heat. Reduce heat to medium-low and cook 20 to 25 minutes or until sauce thickens, stirring occasionally. Makes about 3 cups. 3.Meanwhile, preheat outdoor grill with all burners on high. Once preheated, turn off 1 of the burners for a 2-burner grill, or the center burner for a 3-burner grill. Reduce remaining burner(s) to medium-low. Remove ribs from marinade; discard marinade. Place ribs over unlit part of grill; cover and cook 1-1/2 to 2 hours or until ribs are tender and meat easily pulls away from bone, turning every 20 minutes. 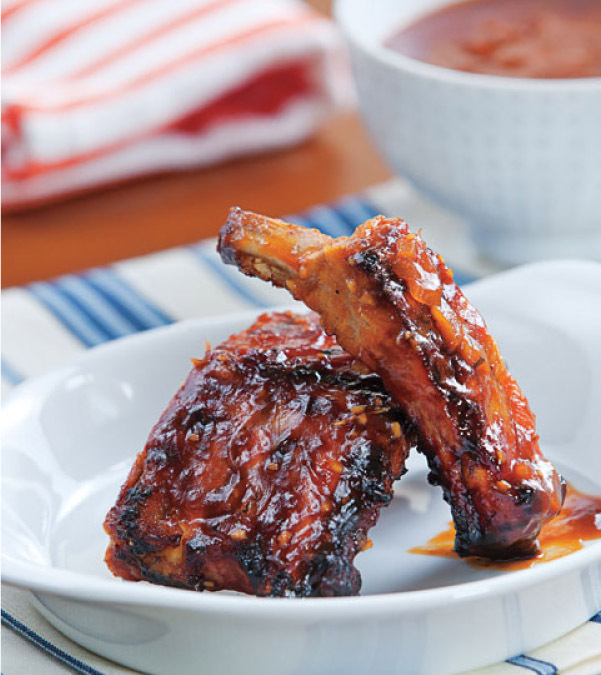 Brush ribs generously with BBQ sauce during last 20 minutes of cooking. Serve ribs with remaining BBQ sauce. > Removing the thin layer of skin on the underside of the ribs prior to applying a marinade allows the marinade to penetrate the meat. To peel skin from ribs, turn the ribs bone-side-up. With a sharp paring knife, carefully lift up the edge of the skin from a corner of the slab. Work your fingers between the skin and rib meat to loosen the skin. Grab the skin with a paper towel and pull the skin across the slab to remove.